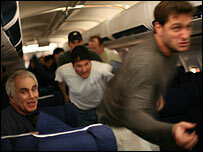 An actor in 9/11 film United 93 has defended portraying one of the victims as an appeaser of the hijackers. Erich Redman plays Christian Adams, a German who died when his plane crashed into a field in Pennsylvania. The film shows passengers taking on the attackers - but only after Mr Adams has tried to persuade them not to. It has been criticised for showing a real victim in a bad light with no evidence. But Redman said: "I managed to stay away from the cowardly side." The film is a reconstruction of United Airlines Flight 93, which apparently crashed before it could reach its target after passengers fought back. It was based on radio transmissions and mobile phone calls - but there is no record of what Mr Adams did in his final hours. His widow did not want to co-operate with film-makers because it was too painful, Redman said. The film, which was largely improvised, shows Mr Adams telling other passengers not to interfere with the hijackers, in the hope that they would land the plane and everyone would be freed. "Initially I was going to be gung-ho as well," Redman said. "In the first few rehearsals we all stormed forward to attack the hijackers because everybody wants to be a hero, especially an actor." 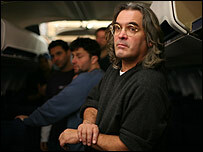 But director Paul Greengrass decided some passengers would have had reservations or been too scared to attack the hijackers, he said. So Redman decided Mr Adams may have been one of those holding back. Mr Adams would have remembered the 1977 hijacking of a Lufthansa plane in which passengers co-operated with their captors and were rescued, Redman reasoned. He also read an interview with a former colleagues who said: "[Mr Adams] never made rash decisions and everything he did was always well-considered." Redman said Mr Adams would not have been "one of those gung-ho Americans wanting to storm towards the cockpit and smash those people's skulls in". "I think he would have said 'let's not do this, let's be quiet, let's not interfere with him, because once we have landed the authorities will take care of it'. "Initially I very calmly argued that we should not interfere with them, we should let them land and get the money and then they will let us out. "I think it's quite a reasonable thing to say." But the decision has come under fire, with British critic John Harris describing the role as "several light years away from artistic licence". "There will surely be all kinds of cries about old European surrender monkeys [and] the US's contrasting backbone," he wrote on The Guardian's website. The Times reviewer Cosmo Landesman wrote: "Surely one of the passengers didn't phone home to point out there was a cowardly German on board who wanted to give in? "The film doesn't want to deal with the possibility that there were Americans who opted to stay silent and seated."